A disk full of copy utilities for the Apple II platform. 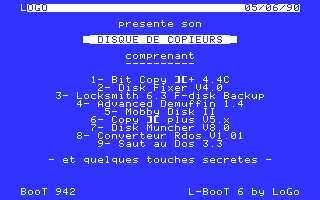 This disk, made in 1990, by Antoine Vignau, gathers all of the most useful software to copy and edit Apple II disks. Enclosed is my famous rDOS 3.2 to rDOS 3.3 which allowed me to "deprotect" SSI games in a minute!